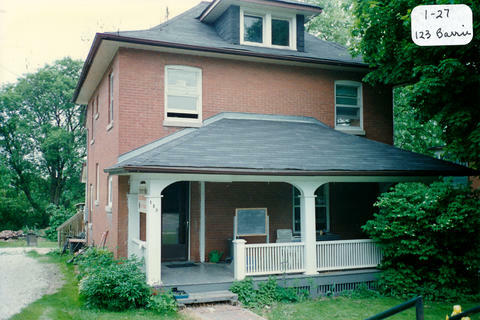 Construction of the house located mid-block at 123 Barrie St. (and six others) was begun in 1912 by Lieutenant George Stoddart. When Stoddart went overseas during WWI, the project was completed by builder Art Saint. The house was built in the Edwardian Classicism style. Archie and Minnie (Spence) Hammel moved up the street into this house. They ran a grocery store on the south side of Holland St. (in the second building from Drury St.) and they both died in this house. Minnie left a lot of the Spence records in the attic. These records dated back to 1900 when her father ran a lumber company in Bradford.